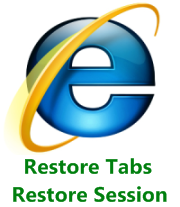 How To Save & Restore Tabs / Last Session In Internet Explorer? Microsoft Internet Explorer does not provide you a very important function regarding restoring tabs which is already present in the Mozilla Firefox browser. So in case your Internet Explorer crashes, you lose all your open tabs and you might have to open the tabs manually from the history. In this article we will tell you how to save and restore tabs in Internet Explorer. 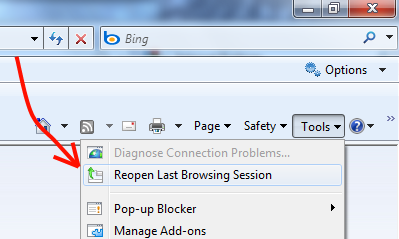 Using this tip you can restore your last browsing session in Internet Explorer. This Plugin uses SpicIE framework and is developed in C#. You can download the plugin directly from the Plugin's Homepage or by using this Direct Link. The plugin is approximately a 4.4MB download. TabSaver is really an useful plugin that lets you restore your tabs easily in case your Internet Explorer crashes or shuts down improperly. You may experience issues with Internet Explorer for the first time after this plugin is installed. To fix this just restart your IE again. This is a good plugin overall and it is recommended for you to install.